As promised, I’ve got a fab printable Mother’s Day Bunting for you to DIY just in time for this Sunday’s events! Print this “Best Mom Ever” DIY Mother’s Day Bunting, & follow along with me. First, cut along the dotted line around each individual flag. Crank some tunes or binge some Netflix, because this takes some time. Next, select which ‘mom’ name you’d like to use. I’ve included the extra letters necessary to make the following names: Mom, Mommy, Mum, Momma, Mother, Mama or Ma. Once you’ve chosen a ‘mom’, place your flags spaced as you like, and lay out your twine/ string over top to measure the length needed. Then cut your twine. Now it’s time to secure your flags onto your string. Place a small piece of tape on the top of your flag. Then, fold the tape over the string and on onto the back of the flag securing the string in the tape. Continue on until all your flags are attached. Voila, you’ve made a festive Mother’s Day Bunting! Now string it up over Mom’s bed, in the living room, over the brunch table, wherever you please. How are you celebrating Mother’s Day? Mother’s Day is this Sunday! So for you babes who are running a little behind on goodies for your Momma, I’ve got you covered. Just print this Printable Mother’s Day Card, grab your trusty scissors, & follow along with me! 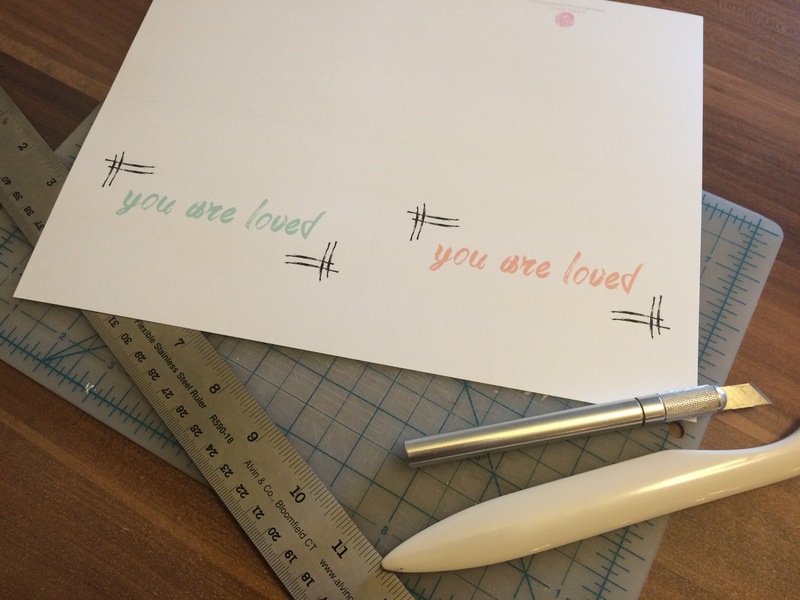 Once you have your PDF printed, it takes a few simple steps to get your finished Mother’s Day cards. First, cut along the horizontal dotted line to separate your two cards. I like to cut with an x-acto knife & a straight edge, but scissors work just as well. Next, fold your cards along the solid line in the center. If you’re using a thicker paper weight like cardstock, you’ll want to score your card for a clean fold. A bone folder like this one is my go-to, but in a pinch, any small pointed edge will do the trick. Just flip your card over & score the inside. Then fold your card over & press down the seam. You’re all done! Not only are you finished with this DIY in a snap, but you also get two cards out of it. Plus, they’re not Mother’s Day specific, so you can gift them to your babes on any occasion. 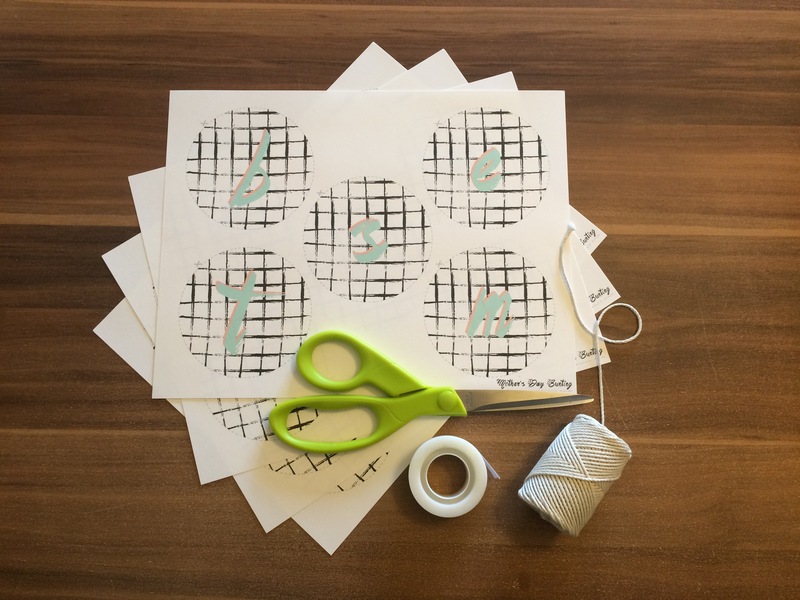 Check back in Friday for a DIY Mother’s Day Bunting Printable! What are you giving your Ma for Mother’s Day? Happy Monday Babes! I hope your weekend was a great one. I’m doing a lot on non-recipe-following cooking this week, so I’ve only got 3 links for you today. Here’s what’s cooking this week. Hola Babes! In anticipation of Cinco de Mayo, I’ve got some festive fiesta inspiration for you! But first, a little history lesson. Cinco de Mayo is a day to pay tribute to the Mexican army’s improbable victory over the French at the Battle of Puebla on May 5, 1862. The French army was well-equipped, had twice the man power, and had not been defeated in almost 50 years, but under the leadership of General Ignacio Zaragoza Seguín, 4,000 Mexican soldiers defeated the French forces. As Time magazine remarked, “The Puebla victory came to symbolize unity and pride for what seemed like a Mexican David defeating a French Goliath.” Mexico did remain occupied by the French a year later, but the victory at Puebla helped establish a much-needed sense of national unity and patriotism. In America today, due to typical over-commercialization and general stupidity, Cinco de Mayo is an excuse to buy (racist) fake mustaches from the party store and get bombed on tequila. I try to keep the core spirit of any holiday in mind when celebrating, so for Cinco de Mayo, I’ll be cooking up some authentic Mexican recipes and enjoying the sunshine with friends. No appropriation or inebriation for this babe. How will you be celebrating Cinco de Mayo? I haven’t written a favorites post since January, because I wasn’t trying many new products. Now, I’ve collected some new (& old) favorites in the months past, so I’m giving you more of a seasonal favorites list today. Here’s a look at some goodies I was feeling in February, March, & April! As you may have noticed, I’m a fan of LUSH’s Fresh Face Masks. But, sometimes they stink. This babe is not only a fabulous cleansing mask, but it smells of warm, sweet honey. The ground almonds in this mask are fairly abrasive, but if your skin is tough, it makes for a great exfoliant. I’ve used this lip balm on & off for like 7 years. It’s always been in my lip balm rotation. I bought a new tube a while back, and wasn’t as in love as I had been in the past. Currently, it’s the perfect formula for my lips. I think it’s important to try products at different times in the year, or in your life. Something you’re not happy with in fall, could be perfect for you in the spring. It’s all about second chances babes! Stripes are everything. A good section of my closet is black & white stripped. So, when I saw this a-line top at H&M, I knew I had to add it to my collection. It’s a lovely relaxed fit, with a generous short sleeve. I also love the higher crew collar. This top is a perfect wardrobe staple. My family sent me these as a gift and I cannot believe I survived without them for 25 years. I’d been needing slippers for some time. I just kept wearing my boo’s, regardless of the fact that they’re like 5 sizes too big, so I’m sure he’s as happy about these Uggs as I am. They’re warm & cozy like my Ugg boots, but in the ease of a slip-on. I am so into Peppermint Patties as of a few years ago. I never liked them much before, but now I’m hooked. So for Valentine’s Day, I bought a themed pack of Mini Peppermint Patties. They’re such a nice after dinner treat because it’s like having a mint, but they’re chocolates! You babes know how I like my yogurt, and this new granola has taken my breakfast to new heights! This crunchy goodness is divine. If you’re a chocolate lover (of course you are) you’ve got to give this granola a try. It’s loaded with sweet cocoa flavor, dehydrated raspberries & strawberries, and little chunks of dark chocolate. I don’t even have to sweeten my plain greek yogurt when I add this stuff because it’s so rich and flavorful on its own. I purchased this candle as a birthday gift for a friend. I could not stop sniffing this bad boy while in the store, so I purchased myself a little votive in the same scent. Because the candle is soy, it doesn’t throw a huge amount of scent like a paraffin candle could. But, even when unlit, you can smell the sweet, fresh perfume from nearby. I feel like such a lady when I have my tea or coffee is this precious babe. When not in use, this cup & saucer lend themselves to my home decor by sitting perched on a stack of books in my bookshelf. I could not get enough of this song in February! (I’m still playing it). I love Ellie Goulding; her voice is that of an angle’s. I really like the whole Fifty Shades of Grey soundtrack, but this track is my fave. As I’ve been reading the most famous book set in every state, I’ve noticed a trend. I’m most draw in by books about families, specifically families who live on farms. Smiley’s novel centers on the dynamics of three generations living and working on the family’s Iowa farm. As you read on, more of the family’s past is exposed and it gets juicier and juicier. It’s truly an engaging read. What are some of your recent favorites? Happy Monday Babes! I hope your weekend was fab. Mine was filled with much-loved relaxation & sunshine that I sure hope carries over into this week. Today is National Picnic Day, Babes! I for one adore a picnic. If it were up to me, every Sunday would include a relaxing picnic lunch. To get you in the holiday spirit, here’s a look at some fabulous picnic goodies! What do you like to bring to a picnic?